Staying in hotels when you travel can become a bit boring. You tend to have the same type of room with the same kind of amenities just in a different place. While it can be nice to have this kind of familiarity, sometimes you may want to experience something new and exciting. Staying in an accommodation like this log cabin rented through Carolina Mornings is a great way to change things up a bit and to feel like you’re home while you’re on vacation. 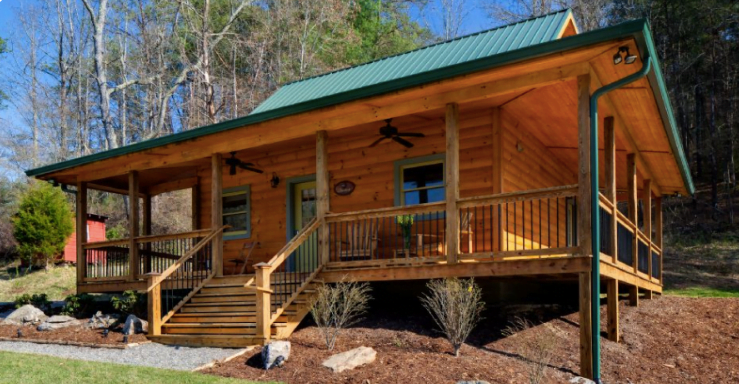 This log cabin called Brookside located in Weaverville, North Carolina has everything you will need to enjoy a relaxing time out in nature. It’s located just outside of Asheville in Laurel Mountain Retreat. Unlike most hotel rooms, you can cook all of your meals in this cozy log cabin. There’s a large fridge to store all of your groceries in as well as a stove and oven to cook healthy meals with. There’s also a microwave for convenience and a coffee maker of course. The kitchen is open to the living room in this log cabin, and in the living room, you’ll find a TV with cable and a lovely gas fireplace you can cozy up to. Cooking can also take place on the grill out on the deck that wraps around the cabin. The deck also has some comfortable looking rocking chairs to look out over the beautiful scenery surrounding the area. They also have a fire pit available to use during your stay. It’s also pet-friendly and wheelchair-accessible. The bathroom and a sleeper sofa are located on the main floor of the cabin as well as a queen sized bed in the loft space as well. Up to 4 people can stay in this cabin at a time. This is just one of five wood cabins at Laurel Mountain Retreat which is on 17 acres of private land. So if you did have a larger group of people wanting to meet up and attend a gathering you could book a few of the cabins. You can look at their other small log cabins for rent through Carolina Mornings, or you can call the rental company directly to book your stay. Another great reason to stay at a log cabin like this one is if you’re considering building a log cabin of your own. Since log cabins are such a big investment, it helps to test a few different designs out before you settle on the one you’ll build. You will find out what you like and dislike which will lead you closer to your very own personal log cabin. There are so many things to think about and decide when you’re planning a log cabin design. You need to consider the design and floor plan, of course, but you’ll also need to figure out details like the log profile and corner profiles. This is the shape of the logs that create the home and the way they are joined together at the corners. You’ll see that this log cabin is created out of D-logs which are round on the outside and flat on the inside. This is a popular choice since you get the look of a log cabin on the exterior, but then on the inside, you are able to decorate with ease because of the flat walls. You can also get log siding that looks like logs but is just a thin siding which costs less in the long run too. Another thing you can choose is the colour of the wood stain as well as the type of wood which can range in colour and price.